Are you searching for solutions to 4 Pics 1 word Daily Puzzles? Here you can check all daily puzzle cheats date wise. 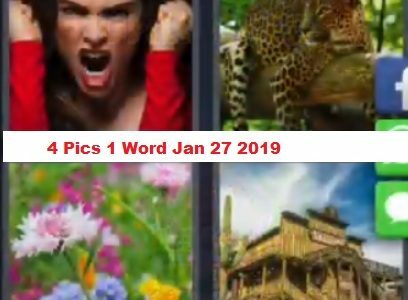 Check 4 Pics 1 word Jan 27 2019 Puzzle answer below. To check more previous solutions click on 4 Pics 1 word answers. Four Pics One Word is one of the top puzzle game. It comes with 4 Pics as clues/Hints to users. Players have to guess the correct solutions by using the hints. Mostly its difficult to solve the answer. So, lot of people searching for solved answers online. Here we are providing cheats to 4 Pics 1 Word Daily Puzzles date wise. Second clue is A Wild Animal Cheetah is sleeping on the tree. Third clue is a Wild flowers tree that eats small insects. Fourth clue is a house destroyed by strom.